We recently received a shipment of the 2007 Domaine Tempier Bandol in our shop and we must admit, we are excited to have it. Domaine Tempier is a very renowned winery, particularly among wine connoisseurs, which has been producing amazing wines from the Bandol region for over 60 years (although the Tempier family has actually owned vineyards since the 1800s). While this wine has become popular over the years, it is actually a very scarce wine due to the relatively small size of the vineyard. Many have been lucky enough to try this wine, but you aren't likely to find it at your average restaurant or liquor store. Domaine Tempier Bandol is exclusively imported by Kermit Lynch, a popular wine merchant. Part of the year he lives in Northern California, where he was born, and part in Provence, France. One of the reasons he chose to live in this region of France (and possibly the primary one) is because he lives, in his words, "near enough to Domaine Tempier that I can fill up the trunk of my car whenever I need to." We certainly appreciate it too, because if he didn't live there this wine would be even harder to come across in the United States. 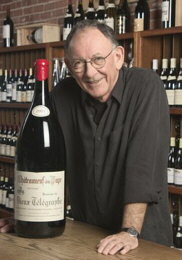 Due to its scarcity, Kermit only sells this wine in a specific quantity to his loyal patrons who regularly sell large quantities of wines he imports. When we found out we were eligible to buy Domaine Tempier, we jumped at the opportunity. Needless to say, this is an incredible wine and won't be available for very long. The Domain Tempier is a rare treat, which makes an excellent gift for both wine enthusiasts and those who simply know what they like. If you want to buy this wine, make sure you order soon, otherwise you may have to wait till next year's vintage!